Sheeriyth Imperative Book Trailer from Biblical Life TV on Vimeo. In The Shinar Directive, we journeyed down the Luciferian rabbit hole to discover the matrix of darkness that has engulfed our planet. It would seem that esoteric societies have nearly fulfilled Nimrod’s dark directive. However, the Almighty will not allow the enemy to bring his “A” team for the final showdown without responding with His own. God is raising up people around the world that are shaking off their techno-sorcery induced, spiritual slumber and are answering Heaven’s call. There is an end-time empowerment coming for God’s Remnant – His Sheeriyth. Hell may have its directive, but Heaven has its imperative! How Nimrod aligned himself with immortals in the Second Heaven to empower his hellish plans and how Mystery Babylon is doing the same in our day! How Heaven is empowering the Remnant to destroy every stronghold and to become a force that can raze hell and bring the Kingdom of God into any situation! The Sheeriyth Imperative is beginning to unfold in our day. It is time to awaken, be empowered, and become the Sheeriyth in this generation! Sheeriyth is a Hebrew word for “remnant” referring to the biblical fact that “many are called, but few are chosen.” The Bible teaches that God’s people are always in the minority, and sometimes that minority can be tiny. You see, God isn’t a universalist. “When the goin’ gets tough, ONLY the tough get goin’.” The word imperative conveys “you must do something about this” – you can’t just sit on the sideline. Put the two words together and you conclude that God is “looking for a few good men” (and women!) Slackers need not apply. The neat thing about the Almighty is that he doesn’t have to have big numbers to dominate. He just needs those that want to join His cause to be 110% committed to win. Next, Michael recounts some of the most intriguing elements of the “watchers” and their offspring, the “Nephilim.” It appears Dr. Lake has been hanging around with some of my old buddies – the likes of L.A. Marzulli, Steve Quayle, Josh Peck, and Derek Gilbert to name but a few – and he’s pulled together a startling collection of new insights that add much to the ongoing dialogue concerning the infiltration of critters from out of this world about which we had better be aware. The Nephilim – progeny of the watchers – were the giants populating the world in the days of Noah mentioned breifly in Genesis 6. They are relevant nowadays because the demons we contend with in spiritual warfare originated from the spirits of these mutant creatures (half angel, half human) who gave up their ghosts long, long ago. But the last section of Dr. Lake’s combat manual addresses some of those things that we who profess to be in the remnant need to be doing if we are to sharpen our swords and our wits to confront these fiendish adversaries. Broadly speaking, the issue is sanctification, pursuing holiness. But more specifically, it becomes a matter of learning spiritual discipline. For instance, I found the advice on fasting to be especially helpful. Not being one to push myself away from the dinner table easily, Michael’s suggestions have given me hope that I can become more disciplined in this spiritual exercise. His practical approach teaches that we don’t necessarily have to go without eating everything for 40 days. Fasting doesn’t have to be an “all or nothing deal.” We best take it a step at a time so we don’t put ourselves in the hospital. For example, just do vegetables only, for a span of time. Then go without all food for a several days. Work up to greater levels of self-denial. The benefit in doing so is that we grow closer to the source of our power in the spiritual realm – the Spirit of Christ. Thus, we get ourselves into fighting shape, engaging in spiritual warfare more effectively, to inflict more frequent defeats upon our darkest foes lurking in the shadows. S. Douglas Woodward, author of the best-selling books, Power Quest 1 & 2, and The Final Babylon: Amerca and the Coming Antichrist. Bible believing Christians have long spoken of Christ’s return and His defeat of our great enemy who deceives the whole world. What should believers be doing in the days leading up to this final confrontation? In The Sheeriyth Imperative, author and biblical scholar Dr. Michael Lake tells us that the day is here when the remnant of God’s people are being called together to face the reemergence and attempted open insurgency of the spirit of Nimrod. God is calling His people into a time of equipping for this spiritual undertaking. Are you ready? Will you set aside the distractions of the world system and take up your mantle of sheeriyth – the remnant? In his book, Sheeriyth Imperative, Dr. Michael Lake effectively lays out the hellish backdrop to the ominous matrix of darkness engulfing our planet. His book shockingly reveals how esoteric societies have toiled for millennia to alter our perception and cast us into spurious enslavement. Lake exposes the final fulfillment of Nimrod’s iniquitous directive as he efficaciously unmasks the most shocking revelation of the twilight of human history. Dr. Michael Lake most incredibly unlocks the puzzle pieces of the epic end time battle. This book is an absolute must read! Dr. Michael Lake’s The Sheeriyth Imperative is an inspirational and informative work that challenges the true Christian believer to rethink much of what has been taught in Christian history about God’s relationship with the universe he has created and with humankind that manifests the divine image and likeness and is designed for intimate relationship with the Almighty. This book focuses on Remnant Theology, the theory and dynamics of those people who have been summoned (called-out) by God to be a Chosen Generation that lets the light of God’s Word shine in the glorious way that makes the Messiah preeminent in all things and leads the fight against the forces of evil which are poised for one last effort to engulf the world and humanity in utter darkness. Regardless as to the depth of the depravity of the masses, the good news is that God’s remnant (Sheeriyth) will be equipped for victory in and through Messiah Yeshua, Jesus the Christ. Building on The Shinar Directive, in which he demonstrated the long shadow of evil influence cast across history by Nimrod, Dr. Michael Lake delivers another fascinating analysis of the spiritual battlefield on which we are all deployed. Dr. Lake outlines the process by which God’s remnant on Earth–His sheeriyth–are being prepared for the troublesome times leading up to the end game of history. Without doubt or controversy, the greatest problems confronting Christianity in this century age of information is spiritual apostasy and Biblical illiteracy among its adherents. Biblical illiteracy in addition to spiritual apostasy has caused the Faith to be perceived by the world as impotent and superficial. The book you now hold in your hand is major step in the direction of renewed spiritual enlightenment and doctrinal reformation. Both which are absolutely necessary if Christianity is to regain the spiritual empowerment and social relevancy the Church possessed and excised in the book of Acts, as well as being the only formidable opponent in the world that will be able stand against the demonic forces of the anti-Christ that has now engulfed all of the secular world and even elements of Christianity. The gospel of the kingdom preached by Christ and then His apostles was validated by God with following signs and wonders. The adherents to Christianity were characterized by love, compassion, power and generosity, all of which were the fruit of a deep abiding spiritually intimate relationship with God and His Christ. Prophecy in the book of Daniel informs us, the same manner in which the Church began (with 11 apostles) it shall conclude this dispensation in the same manner by a group of believers the prophets refer to as the remnant. 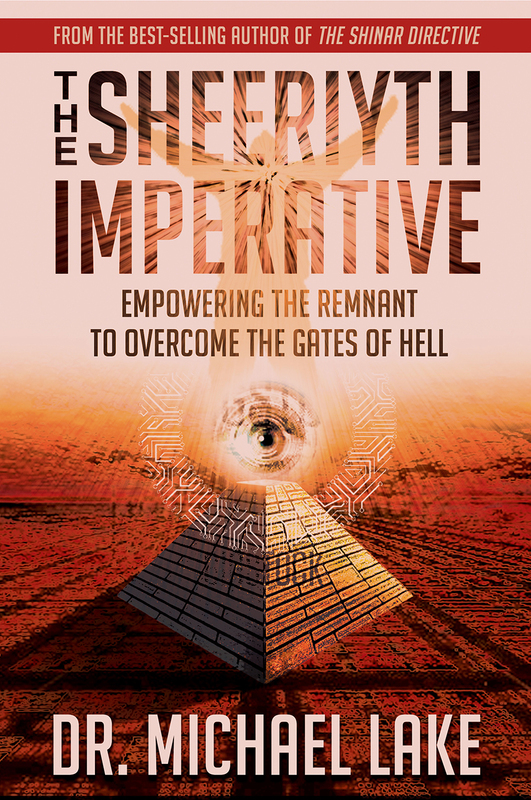 Dr. Michael Lake’s book, The Sheeriyth Imperative, is about that remnant and therefore could very well about you. Your book the Sherriyth Imperative lines believers up to be those who will stand in these last days. I highly recommend this book for all Christians to help them transfer from that of being a proponent of ‘mere Christianity’ to that of a ‘Warrior for Jesus Christ’!